The Payroll Fundamentals course provides payroll education and helps candidates pass the Payroll Certification or Payroll Fundamentals exam. The course does not include the exam. The Payroll Fundamentals course addresses the latest laws and up-to-the-minute updates regarding payroll. This training focuses on application rather than theory. Examples and real business applications enliven this training and demonstrate the relevance of what you are learning. 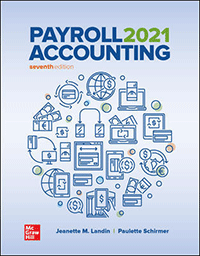 This training helps you prepare for career success with first-hand knowledge of calculating payroll, completing payroll taxes, and preparing payroll records and reports. The training includes the payroll changes for the Tax Cuts and Jobs Act of 2017 (TCJA) signed by President Trump. The course is self-study and self-paced and you may begin the course at anytime. To order this course, click the Order button below. Please allow 5-7 business days for delivery. Your package will arrive via United States Postal Service 3 Day Priority Mail. NACPB has a simple, straightforward satisfaction policy. If you are not satisfied with this course within 14-days of your order, return the course materials in resalable condition and the fee will be refunded. For more information on NACPB administrative policies, such as refund or complaint policies, email or call NACPB at info@certifiedpublicbookkeeper.org or 1-844-249-3551. If you have any questions or need assistance, please Contact Us.